We aren’t precious about our toys; not precious about much that belongs to the kids, really—only passed-down vintage clothes. We have two baskets for the kids: One for stuffed animals, most of which have been around for their entire lives or even before they were born; and the other, a combination of gifts we’ve kept over the years or things River has purchased with her own allowance. Even on Christmas, we give one or two toys each. Less is more. Truthfully, I didn’t think I would have this approach to children’s toys. I always had a lot, shared with my siblings, and loved the way it felt to unwrap a something new. I’ve gotten pickier as I’ve grown older, and I notice what my own kids do and don’t play with, what takes up space but isn’t used. River isn’t a real independent player and Oak is, so it’s wonderful to also see how their minds work so differently while playing. Oak will find a toy and a corner and have at it. River wants me down on the floor, interacting, and imagining whatever voices and characters come out of our collective imaginations. 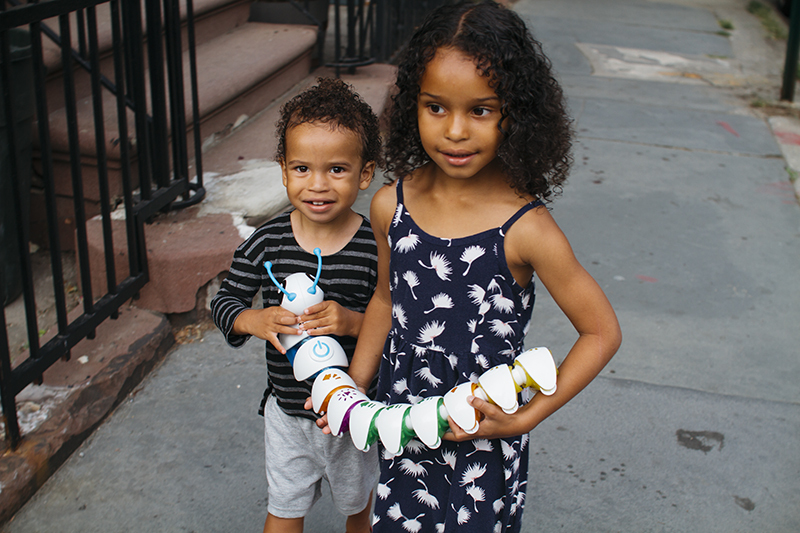 When Fisher-Price reached out to me and asked if I wanted to give their Think & Learn Code-a- Pillar a try, I said yes. We hadn’t bought any new toys in a while, and the way the Code-a-Pillar would require their very different minds to think critically, intrigued me. Almost every night this summer, around 6:30 pm, when the sun is still shining bright and the kids have had their baths and are preparing to eat their dinner, I feel just a tad guilty. The sun’s movement doesn’t match their bodies’ internal clocks, and I’m left with the conflict a lot of mothers face in the summer: “Do I keep them up?” If it’s been an easy day, the answer is usually yes. We play a little more, read a little more, maybe we even build a fort. And on the night Code-a-Pillar arrived, it was so beautiful to see the kids’ excitement as I told them we weren’t reading, we weren’t building, we were going outside one last time to play with this new toy. The named their Code-a-Pillar LuLu LaLa, and they thought about and interacted with her equally. It was kind of surprising actually, considering their age difference. River would take the lead, showing Oak how LuLu LaLa would move there and here, depending on how he arranged her parts. A few times, they would take it all apart, press her buttons, and start again. Oak was the bait, River started her up, and LuLu LaLa would begin her short journey to Oak. And here’s what I found most wonderful: We were in the middle of the city, past the kids’ bedtime, on some sidewalk, sirens going, dogs barking, and there are my children, 100 percent invested, thinking critically and problem solving, with their little minds expanding as they play. I could stand back and see it, theirs and LuLu LaLa’s wheels spinning together. This is so cool. I don't have children of my own but one of my most favorite things is getting to sit back and watch my friends' kids learn as they play–figuring things out. What an honor to get to be privy to those sacred moments of mind development. Thank you so much. It's beautiful to watch.